In addition to making a wide range of power drills and machine shop saws, Stihl also manufactures chain saws. 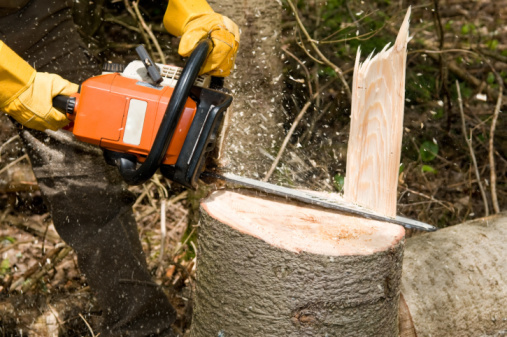 The 028 Wood Boss is a chainsaw that Stihl has manufactured for a number of years. When trying to find replacement parts or other maintenance-related information, it might be necessary to know the exact year your Wood Boss was made. This information can be obtained through Stihl with just a little information from your end. The model number and serial numbers are needed to identify what year uyour Stihl saw was made. Set the Stihl chain saw on a work bench. Turn the saw around so that the blade is pointing towards you. Find the saw decal located at the bottom right where the saw's bar meets the base of the saw. Beneath the UPC code is the serial number. Call Stihl customer support at 800-610-6677. Give the customer representative agent the serial number and they, in turn, will be able to look up the year the saw was made. Andrea Walk began writing in 2001, authoring user guides for technical software. She holds a Bachelor of Arts in political science from Loyola University, where she was a member of the Dean's Grade Review Committee for English. Walk is a member of the Automotive X-Prize team Global-E.
How Do I Find the Date of Manufacture For a Rainbow Vacuum System?